Rebecca Gall is a young rider that lives in Saukville, WI on her family’s hobby farm. Becca started riding horses when she was 3 years old. 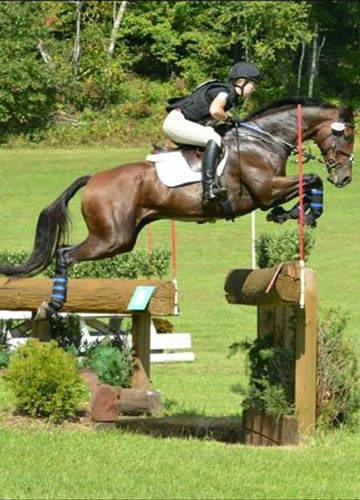 She is a member of the Lakefield Pony Club which introduced her to the world of eventing. She is also a member of the local 4-H Horse and Pony Project where she participates in barrel racing. She currently attends Cedarburg High School. Becca’s main riding interest is eventing. She did her first event at 9 years old with her pony. She then advanced with an older Thoroughbred gelding who really taught her what eventing is all about. She is now partnered with her 10 year old Thoroughbred, Digger. The two of them have successfully competed through the CCI* level. Becca and Digger were selected for the Area IV CCI* Young Rider Team this past year and their team finished in 4th place. 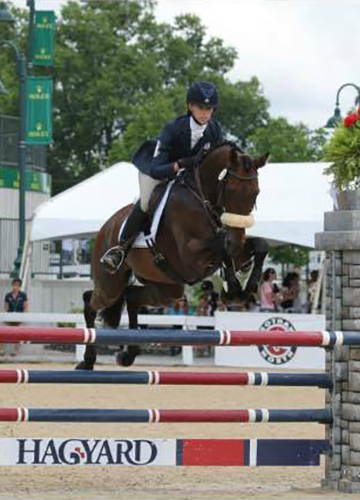 She trains with Chrissy Hollnagel and Sara McGowan from Willow Run Stables in Mequon, WI throughout the year. She has also had the opportunity to work with Missy Ransehousen and Jon Holling. My 8 year old Throughbred arrived from Florida at my barn in Saukville, WI during the coldest time of the year. He was not used to the cold weather and became quite a handful. We began giving him the Serenity supplement and within a month he became much more manageable. The Serenity helped to take the edge off of him and he became more cooperative. Sound Horse liniment is a product that I use on a regular basis. I use it after strenuous schoolings and at shows to help keep his legs as tight as possible. I recently used it as part of his massage therapy after he pulled a muscle playing in the pasture. Definitely a great product to have on hand!